There are 17 comments for this item. I lived in Manitowoc, WI which is about a half hour drive from Sheboygan the home of Mayline. I go back a little further than this board. This board has a drafting machine attached. 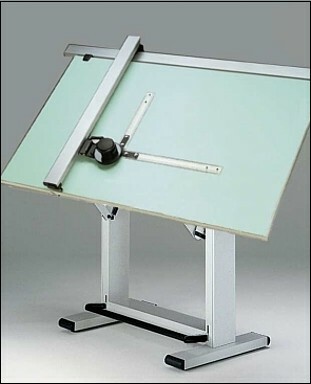 I started with a Drafting Board, T -Square, and Triangles Fell in love with Drafting, became a draftsman, and eventually an engineer, I still have a drafting board set up in my home with T-Square etc. I had a wonderful electric motor driven eraser which a skilled hand could wield like Rembrandt ... long rubber refills were pink and smelled good. Of course, a skilled draftsman rarely needed his ; I just liked mine - it had a hangar for the hook on the bottom edge of my board. Sorry, Paul. There's nothing for sale on this site. But see the Gift Shop page for suggestions and links to other sites. I want to buy this table! How much and how do I order it? @Tommie - Thank you for NOT mentioning the "nightmare of all nightmares". Inking a fillet or a hidden circle. When I had drafting- we didn't have circle/oval templates yet. @tommie - And who can forget the pens for doing ink drawings. They had the thumb-wheel for adjusting the the space between the nibs to make the different types of lines. Mechanical pencils are still being made, but insteada rwisting the lead up you push the base to advance the 'lead' (which as we all know contains no lead (Pb) - it's a mixture of graphite and a binder)...seems to me that the 'lead' currently being used is of lesser quality, or the pusher advances the lead too far...I used one last month and kept breaking the 'lead' to the point where I just gave up!!! Y'know? I haven't seen a mechanical pencil in eons. I guess they're still being manufactured. The table my dad had used it for home projects such as designing decks for the backyard. Sorry (?) about that, Tommie. I was one of the original programmers responsible for creating AutoCAD. I trust it was a positive development . I still have my french curves.